Elizabeth Tower houses the huge bell nicknamed the Big Ben. It's a part of the Westminster palace, and a sure place to attract lots of citizens on sunny days. 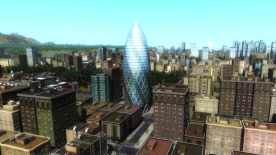 Sleek, modern and gherkin-like, this landmark will be one of the busiest places in any town. Building a line to it will always bring you profit! The gothic elegance of the Cologne Cathedral is unsurpassed. Place this landmark in your city to make sure the masses flock to it. One of the most famous landmarks in Germany, the Brandenburg gate, is a very popular destination in any city. Place it to have lots of people moving around!